Even though the 4th annual NYC Urban Tattoo Convention was at the end of June, I'm still reliving the experience through posts of tattoos I saw there. 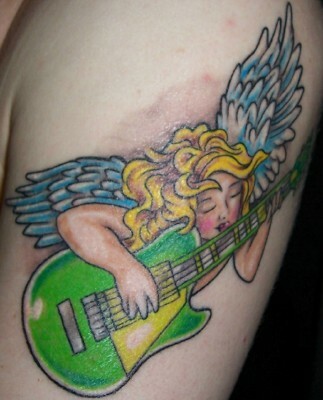 I recently followed up with Cecilia and asked her specifically about the tattoo. First, she credited this lovely work to Kristin Lowery, owner/artist at South Seas Tattoo in Hilo, Hawaii, who used a feather Cecilia had found in New York as reference material. She said she was "pretty sure, after researching, [that] it's a hawk feather." I got [the tattoo] on my left side which represents the feminine and I got it on my rib cage for it to land close to my heart and aligned with the 3rd chakra solar plexus and heart chakra. Chakras are energy points in the human body. 3rd chakra is a energetic center for empowerment, where your ego lives, where your inner warrior develops and where you decide who you are and project it out unto the world. It is from this place that our principles are born and developed, and where our codes for living get created and maintained. It is from here that we assert our will and stand up for 'who we are.' Self-esteem is the result of the third chakra. [This tattoo] represents for me a rite of passage to connect with my true nature, to gain spiritual awareness, to own my power and to become the person I was meant to and fulfill my purpose in this lifetime!" Cecilia's spirituality should come as no surprise, as she is an New York-based artist, whose photography can be seen here. You can also visit her Etsy shop here. Thanks to Cecilia for sharing this lovely tattoo with us here on Tattoosday! Tina credited this work to Laura Babsie Gardner, formerly of Kitchens' Ink Tattoo & Art Gallery in Denver, Colorado. Laura is currently working out of Madeline Hair Design in Denver. She explained to me that Babs had told her she "always wanted to do a lace doily tattoo and I said 'Sure, let's do it.' "
It's a really interesting application of grey and white ink. Thanks to Tina for sharing this wonderful tattoo with us here on Tattoosday! Generally, we celebrate tattooed poets during National Poetry Month, but is there ever a bad time to embrace poetry and the inked wordsmiths who ply the trade? "In anticipation of my first-born seed, Avery Langston Moody, who will be due on October 29th, 2013, I wanted to get my first tattoo. After searching on-line, I found a salient piece of artwork that contained two tattoos in one: an ankh superimposed over the Eye of Horus. The latter symbolizes my philosophy on fatherhood and writing, and the former underscores my wife’s personal struggle to conceive a child. In Egyptian mythology, The Eye of Horus represents protection and sacrifice. In other cultures, it symbolizes a human’s capacity to 'see beyond.' As a husband and a soon-to-be father, I am a protector and am willing to offer myself as a sacrifice if my wife or son were ever in harm’s way. As an artist, I perceive the world via an alternative (i.e. creative) lens. At times, what appears in front of the artist can prevent him or her from focusing on the big picture; however, those who can access a higher plane of consciousness can look into the world as opposed to at it. Possessing the ability to interpret and/or create metaphor is one byproduct of accessing a high level of consciousness. Technology, comet, dinosaur. To the person looking at the world, those three words are unrelated. A person looking into the world could create a metaphor that shows how all three words are linked: Technology is a comet obliterating any dinosaur roaming in the field of education. Metaphor is a bridge between seemingly bizarre connections. The Eye of Horus tattoo on my right forearm reminds me that my poetry should 'see beyond' what is possible to the eyes of the average reader. The ankh is symbolic for life and fertility. Over the course of five years, my wife has struggled to achieve the latter. She’s battled endometriosis and ovarian cysts. Injected numerous fertility drugs. Endured a failed IUI. Fortunately, in January of 2013, her first IVF attempt was successful. Now, seven months into her pregnancy, she has a three-pound hyperactive boy kicking her right side nonstop. Anyone who looks at my forearm tattoo will merely see an ankh superimposed over the Eye of Horus, not my wife’s fertility struggle intertwined with my struggle to become a paternal figure. As Larry, the tattoo artist at Dago’s (off of 45 South), pressed the stencil against my forearm and started doing the outline, I had considered telling him the background story. Instead, I focused. Focused less on the pain and more on keeping my right arm still for thirty minutes. Did not want the ankh to be mistaken for a lollipop." We're honored that Jonathan chose to share this very personal story behind this tattoo. Congratulations to him and his wife on the upcoming birth of their son! himself he’s done something wrong. Society made me out to be. against the coral reef of hard time. Jonathan Moody received his MFA in Poetry from the University of Pittsburgh and his BS in Psychology from Xavier University of Louisiana. He’s also a Cave Canem alum whose poetry has appeared in African American Review, Crab Orchard Review, Gathering Ground: A Reader Celebrating Cave Canem’s First Decade, The Pittsburgh Post-Gazette, Xavier Review, and numerous other journals. 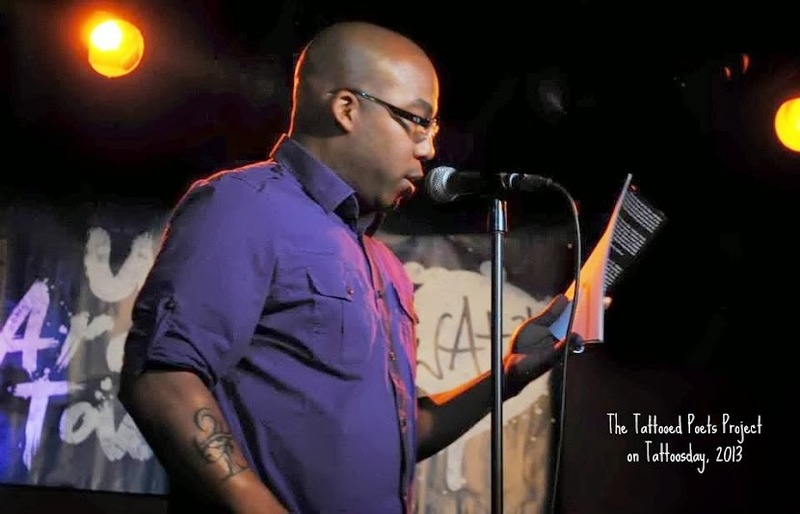 In 2012, he was selected by a committee to be a featured reader in Houston’s Public Poetry Reading Series. Moody also appeared in Houston’s 2013 Word Around Town Poetry Tour lineup. He is the author of The Doomy Poems (Six Gallery Press, 2012) and lives in Fresno, Texas, with his wife. Thanks to Jonathan for contributing to the Tattooed Poets Project on Tattoosday here in August! This piece was also done by Splinter. This is a take on the whole "See No Evil, Hear No Evil, Speak No Evil" motif, but Jenny said it has the extra meaning for her of "To each his own ... no judgment." Thanks to Jenny for sharing this cool tattoo with us here on Tattoosday! Although the tattoos on Tattoosday come, for the most part, from people I've met on the streets of New York City, I occasionally get submissions from surprising sources. 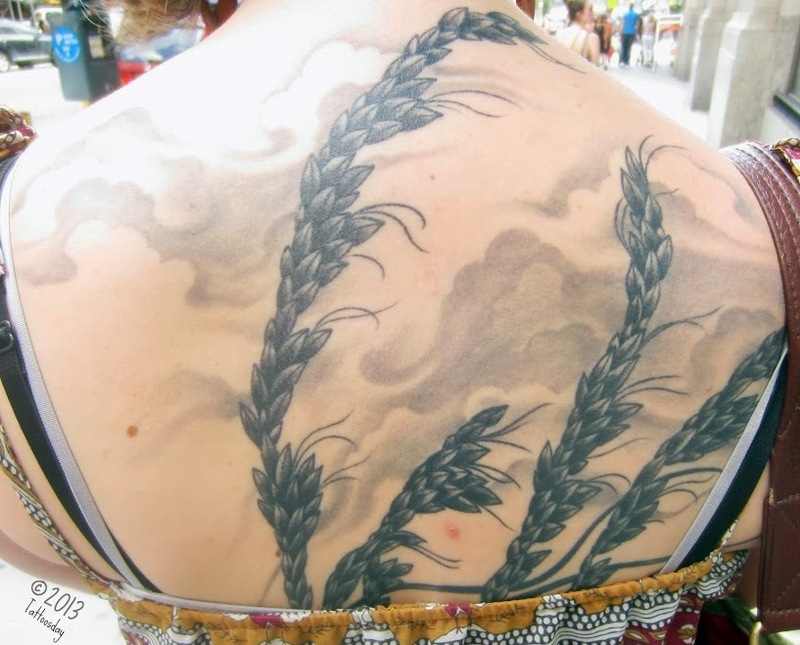 "I love your blog about tattoos, and wanted to share one of my favorite tattoos with you. It's from a friend [Kris] who lives in California who is passionate about food and wine. She was married in an old barn in Healdsburg (Napa Valley region) last year. On her wedding invitations, she had a wine glass stain. She took that same stain and had an old tattoo artist in San Francisco bleed the ink to make it look like the wine stain. She had an old tattoo of two tusks made into old fashion wine openers. The French words la vie est trop courte pour boire du mauvais vin mean life is too short to drink bad wine." I can see why Mary loves this tattoo so much. There's a lot of meaning in it and it's done exceptionally well. I reached out to Kris to get some more detail. She credited the artist Rob Merrill at Goldfield's Tattoo Studio in North Beach, San Francisco. Kris told me that she "brought in a really loopy French font that would have been too thin to do in the space needed so Rob actually drew this font on his own." She acknowledged that Mary pretty much described the origin of the tattoo above, but added, "The quote has a double meaning for me, with the other meaning being live your life however makes you happiest." Thanks to Kris for sharing this great tattoo with us here on Tattoosday, and to Mary for sending it my way in the first place! A few weeks back, my lovely wife sent me a link to another fabulous Buzzfeed list. The subject this time was Harry Potter tattoos. Check out the whole list here, along with a link to a Tumblr dedicated to Potter ink. And here you will link to several Potter tattoos that have appeared previously on Tattoosday. This is another post about some cool work I spotted at the 4th Annual New York City Tattoo Convention. This piece was done by an artist named Albert Martinez who tattoos under the name "Splinter." When I asked why she got a cheetah, Erika indicated it really fit her personality. "I just got it 'cause I'm wild and ... I do what I want," she told me. 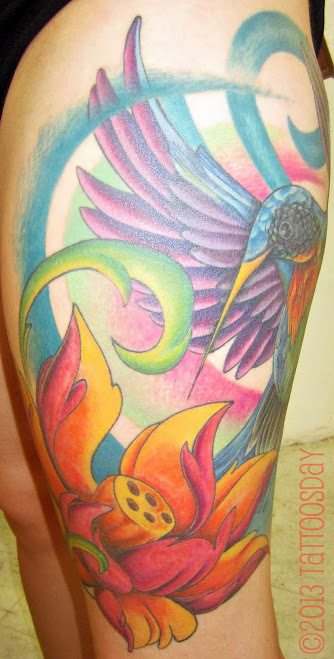 Thanks to Erika for sharing this wild and colorful tattoo with us here on Tattoosday! I posted last month about attending the 4th Annual New York City Tattoo Convention here. This incredible lion tattoo is on the left arm of Arielle, who credited the work to the artist Dee Whitcomb at Wyld Chyld Tattoo in Merrick, New York. Arielle told me her name means "Lion of God," so she went with this design which Dee drew up and tattooed on her. It's really a beautiful tattoo that certainly captures the grace of this majestic animal. 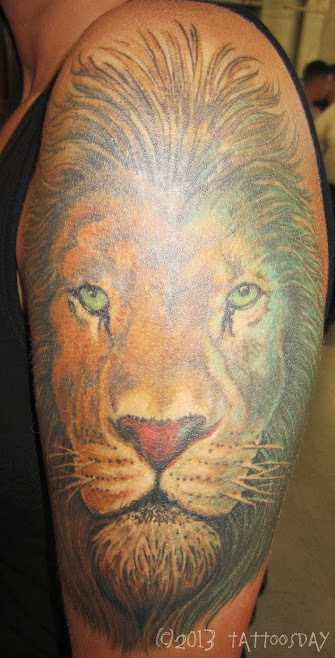 Thanks to Arielle for sharing her lion with us here on Tattoosday! The top of the back reads "Brooklyn" and the bottom sums it up: Angels & Demons. "It's just the passions of my life. I went through turmoil and came out of it. So, basically, I'm wearing on my skin, my griefs, my sins and my dislikes." He couldn't be specific about who did what, but he said that the majority of the work was done by Coney Island Vinny and Michael Angelo, two staples of old-school Brooklyn tattooing. Thanks to Johnny for sharing his back tattoos with us here on Tattoosday! 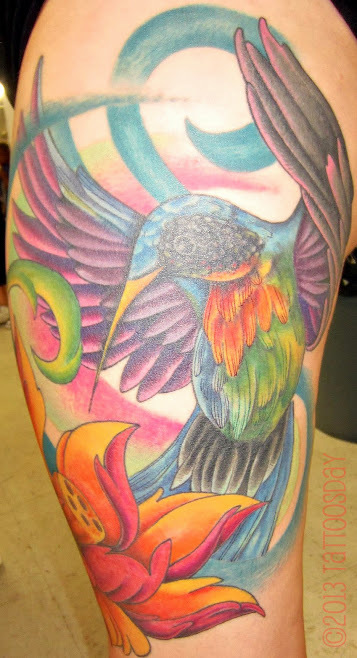 Taylor credited this colorful hummingbird to the artist Richard "Made Rich" Parker at Think Before You Ink in Long Island City. Made Rich is currently vying for the title of Ink Master on the show's third season. Taylor said that Made Rich free-handed the drawing directly onto her skin, and that it took four sessions, because, as she put it, she was a "cry-baby." This tattoo was one of the highlights of the convention for me, and I am happy Taylor allowed me to share it here on Tattoosday! Thanks, Taylor! Krystal credited this work to a friend of hers that tattoos freelance under the moniker Shane White Trash. Krystal found the quote online, and it appears to be unattributed, one of those sayings with an unknown origin that resonates so profoundly with people. Thanks to Krystal for sharing this, one of her eleven tattoos, with us here on Tattoosday! I love textual tattoos and am more inclined to stop people who have words inscribed on their flesh. Her left leg reads "nature is a language" and her right leg asks "can't you read?" 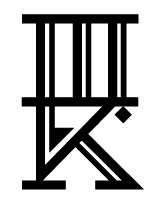 About eight years ago, Caitlin told me, she and two of her friends all got this same tattoo, which references lyrics from "Ask" by The Smiths. The work was done by an artist at Bodytech Tattooing and Piercing in Gainesville, Florida. We featured work from the same shop here back in 2008. Thanks to Caitlin for sharing this lyrical tattoo with us here on Tattoosday! The artist is Joel Brennan a.k.a. Suga Bear, who owns and works out of Steadfast Tattoo Parlour in Erie, PA.
"He [Suga Bear] drew it and the concept is sea oats, which represents my family and my love of the ocean ... We went on vacation every summer to the Outer Banks of North Carolina and there's beautiful sea oats in the sand dunes down there." Thanks to Anna for sharing this lovely tattoo with us here on Tattoosday.